Yesterday was great! Me and Mr. Bentolicious had a great time together. We had a romantic lunch date at one of the Chinese restaurants. I arrived first and few minutes later hubby showed up with a sweet bouquet on his hands. We gave each others gift & card at the restaurant and really enjoyed our lunch for two. My card was bought at the last minutes because I couldn't find an anniversary card at the mall near our house. After lunch, we headed to a cafe and had a chat there for about 2 hours before we went home. Usually we had a celebration at night. But this time we would like to avoid bad traffic jam after office hours, so we decided to celebrate over lunch time. 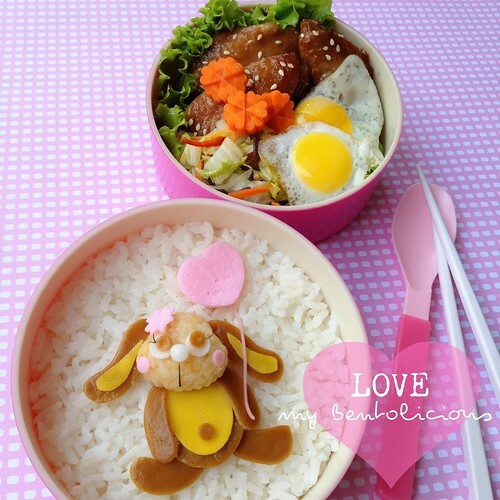 Love is still in the air, so for today's bento, I made brown doggie with heart-shaped balloon. After saw the picture, I realized that I should have put more details on the eyes. I'm sure my kids wouldn't mind though. Little A asked me whether I could put a 'love letter' inside his bento bag. What??? I put a small note inside his bento bag long long time ago. And he wanted me to do that again. Oh boy! Inside the box : rice, braised soy sauce middle wings, carrots, fried quail eggs, and veggies stir fry (Chinese cabbage, carrot, big red chili, ear wood mushroom). How sweet that both of you still celebrate and have a hearty chat.. bet both of you were best friend before you got married. and Little A got jealous and wanted a love letter from mummy too..aww.. Sounds like a romantic and fun celebration date with your hubby! How nice. Love your detailed doggie and sweet bento! @sheri fujihara chen : Yes, I guess so. Maybe because he is the youngest one in the family, so sometimes he more attach to me. Thanks Sheri! Haha, asking mom for a "love letter". How sweet :o) And so it the dog, cuteness galore. It sounds like you both had a great time on your anniversary date. Little A is so cute! Isn´t it amazing when you hear such "hints" from lil guys? Totally unexpected :D.
You had a sweet celebration there yesterday! Happy 15th Anniversary again, so romantic! so glad you and hubby enjoyed your anniversary lunch lia! this cute lunch looks delicious -- who can resist a pair of perfect sunny side up eggs! and you've cut the carrots just beautifully. It sounds like you had a lovely day! The doggie is so cute. I love the balloon :) The carrots are exquisite! Can you do a tutorial on them, please please please? Sounds like a wonderful anniversary!! Congrats :) I love the sweet bunny bento! Happy anniversary - such a sweet way to celebrate! ^^ And you already know how much in love I am with your bentos! @AikoVenus : Thanks a lot Shin! Can I know how dId u carved those carrots? I love your bentos! I wish I could prepare such a beautiful bento for my kids. Too bad I'm not as skillful and creative as you! :) By the way, may I know the pink polka dots background that you use for this picture, are they cloths or paper? Where did you buy it from? Thks Lia! I love your bento creations... they give me ideas to create my own looiking ! Great looking bento boxes... they give me ideas to create my own!